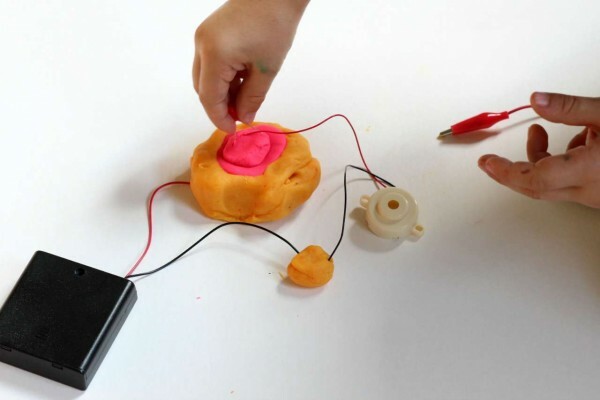 I’ve always wanted to do a squishy circuit experiment with my kids, but you know me. While we love science experiments around here, I find it challenging to collect all the requisite parts for a project if I don’t already have them in my home. Then, two things happened this summer. One, the boys came home from their STEM summer camp and told me about how they created circuits using play dough. 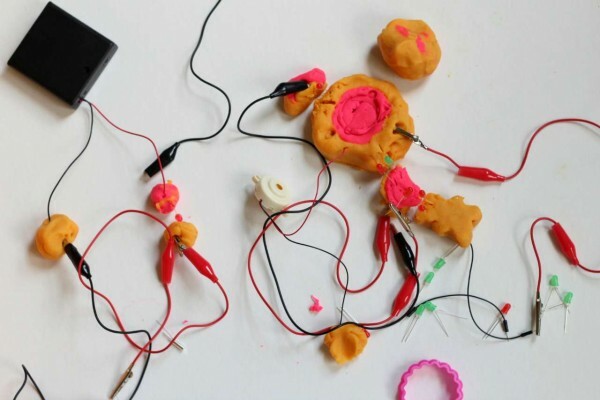 And two, Technology Will Save Us, a British company that makes super cool STEM-based kits for kids, contacted me about their DIY Electro Dough set and I agreed to try out and tell you about it. You may recall, we did an incredibly simple at home circuit project earlier this year, but this kit allows for many more possibilities. 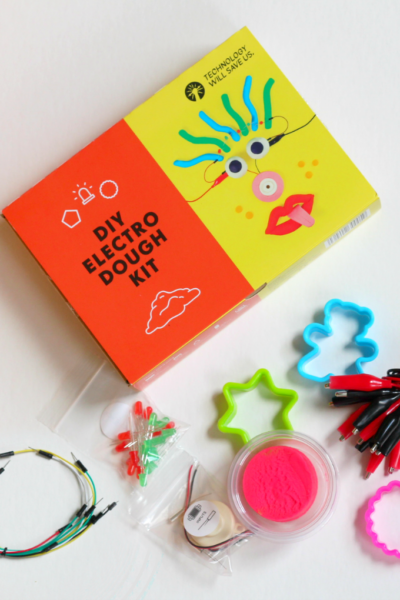 The Electro Dough Kit comes with buzzers, wires, switches, LED lights, a battery pack and a few cookie cutters. It includes a dough recipe so you can make what ever color you like. (There is play dough in my photo, but it is not included with the kit.) Of course, store bought play dough will work just fine, too. The kit is rated for ages 4 and up, so one afternoon my 6 year old and I had a go at it. I particularly like how there were a lot of parts to experiment with. My son’s favorite piece was the buzzer! I made a quick (and rather shaky — sorry about that) video of how he used a dough “button” to switch on the buzzer. Notice how he didn’t make the correct connection right off the bat, so he had to learn about the circuits. That’s exactly how we want our kids to learn! If your kids are artistically inclined, or they want to tinker further, there is a lot of opportunity to create elaborate projects. As you can see, our first foray with the kit was quite the jumble, but the website has some pretty awesome ideas that you should absolutely take a look at. I want to try this football themed penalty shoot out game with my boys! You can find the kit, and many other STEM and technology themed kits for kid of all ages on their website: TECHNOLOGY WILL SAVE US. Spoiler alert: We also tried out the DIY Gamer Kit, and I will share our experience with that soon. I saw this at the library and wanted to check it out! But I thought my 4 year old was probably too young to appreciate it. She’s entirely average. What do you think? The kit is for kids ages 4 and up. I think a 4 year old could definitely do it, although it will require adult supervision.